You'll be £8.99 closer to your next £10.00 credit when you purchase Norfolk at War 1939-45. What's this? 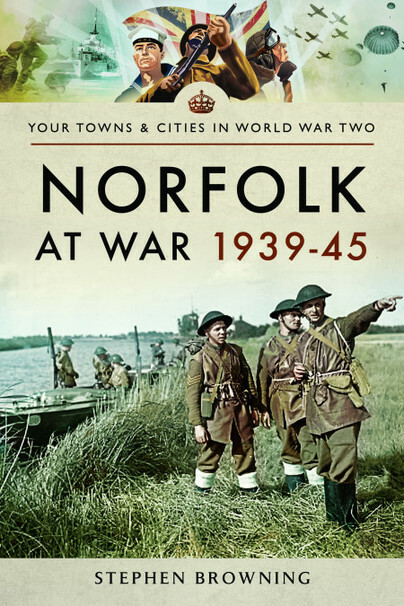 This year-on-year study of Norfolk at war is the first such for many years, which utilises material that has not been published in book form before or, sometimes, at all. In both the First and Second World War, Norfolk was pivotal, albeit for different reasons. During the war of 1939-45 Norfolk was home to many bases of the USAAF, changing the area forever with bases remaining a fond feature of Norfolk life. Another unique and enduring legacy was the arrival and often permanent settlement of many Poles, who are commemorated today by a shrine in the Cathedral of St John the Baptist in Norwich. Norfolk was in many ways changed forever as it had largely, up until this time, been proudly, even stubbornly, isolated – a feature that could not have changed more dramatically. This study is both inevitably a military and social study. The major events both at home and overseas are laid out, together with a description of how home life unfolded in very dark times when the stoicism and humour of the Norfolk residents were tested. Contemporary material from newspapers, diaries and local records, as well as over 200 photographs, are used to bring life and colour and life to the account. Stephen Browning has put together a fascinating account of Norfolk during the war, and takes us on a fascinating journey with great illustrations and photos.